This is a nice small blond all-bisque girl for the doll house. Fine painted facial features, blond wig. Dressed in her fine white gown with fine underwear. Fine molded and painted shoes. She is 12 cm / 4-1/2" Tall. Very goodcondition. This dollhouse lady is elegant in the way she stands with her bent arms and perfect posture! She has sculptured eyelids and there is a red line painted over the eyelid. Her mouth is beautifully defined and she is wearing a wig.Her dress and large hat are all original and in the perfeckt style to her period.Good condition all over. 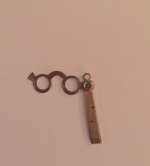 Size : 17 cm /6 3/4" and with hat 18 cm / 7"
A pair of fine miniature Lorgnette for the dollhouse or doll. Antique Chantelaine with clock. 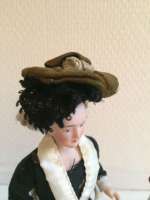 Ormolu and turquise enemal for the dollhouse or for French Fashion doll. France 1880. Lovely all original French accessory. Ca 1880. Size: Watch across 3/4" / 1,2 cm. Chain:4" / 10 cm. Excellent condition. Antique Chantelaine French enamel fashion Watch for the dollhouse or for French Fashion doll. France 1880. Antique Chantelaine French enamel fashion Watch.. Ormolu and turquise enemal for the dollhouse or for French Fashion doll. France 1880. Lovely all original French accessory. Ca 1870. Size: Watch across 3/4" / 1,2 cm. Chain:4" / 10 cm. Excellent condition. Very rare Ormolu small ink cleaner brush on stand. 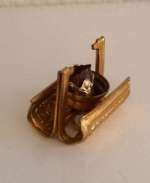 Fine and all original ormolu rare to find item. Made about 1880 by Erhard & Söhne, Germany. Excellent and original. A lovely item for your doll house desk. Siehe item in Swantje Köhlers Book p. 73 item 3515. Measurements: 8/8"w. / 2 cm Literatur: Swantje Köhler: Goldenes Puppenstuben-Zubehör. Swantje-Koehler-Verlag. 2007.